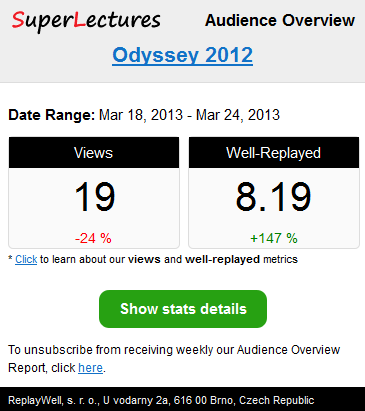 We are thrilled to announce a release of our audience overview report. 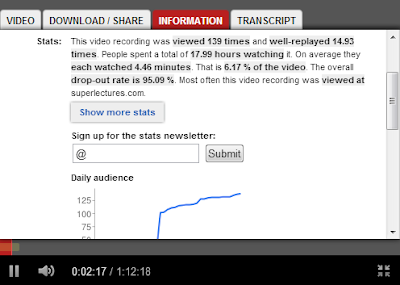 Anybody can now subscribe to receive weekly stats information for the whole event or a particular video recording. The subscription can be done using the Sign up form on the the information tab in our player (see the image below) or by clicking the Stats email subscription button on our stats pages. After filling out the form with your email address, you will be sent a message with the activation link. You can sing up for receiving stats information from as many recordings as you like. You can also manage all your subscriptions and easily unsubscribe from those you are not interested in anymore. An email with stats information is sent every week with stats collected during the previous Monday-Sunday period. If there was no view during that period, the email is not sent. We also provide you with a percentage ratio showing the progress since the previous week. We hope you will like and use our new feature.